The term 'bonsai' literally translated from Japanese means tray planting or tree in pot. The term refers specifically to the training and artistic vision applied to the tree; ultimately this will give the illusion of an aged miniature tree in nature. It is more than just a little tree, it is an attempt to represent nature itself in a small pot. 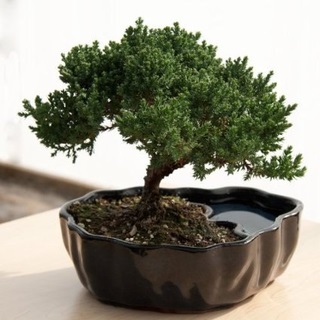 Translated as potted tree, bonsai trees are the attempt to represent larger natural tree forms in a diminutive scale. In this case we have chosen a hardy 3 year old juniper for its long trailing brances, which are easy to train into many fantastic bonsai styles. Delivered in a beautiful 7" glazed clay earth/water pot that is complimented by Japanese suiseki balance stones and a miniature fisherman.